In 2013, almost 70% of potash production was controlled by two cartels, Canpotex and the Belarusian Potash Company. The latter was a joint venture between Belaruskali and Uralkali, but on July 30, 2013 Uralkali announced that it had ended the venture. How is potash shake-up affecting local industry? The potash industry has seen prices and company shares plunge, in response to events on the other side of the planet. The $20-billion global potash market was thrown into disarray this week with the collapse of a European cartel. Some analysts predict the price of potash will plunge by 25 per cent. However, Potash Corp says it has weathered market volatility in the past. Hundreds of mining jobs in New Brunswick depend on potash exports. The mine is a pillar of the Sussex economy, but the economic impact reaches far beyond the town, throughout southern New Brunswick and into the Port of Saint John. Construction of a new mine - a $1.7-billion mega project - is nearing completion and according to the province’s natural resources minister, Bruce Northrup, that project assures a long-term future. The stocks of potash producing companies around the world have been plummetting amid fears of a price war after a Russian company threatened to pull out of a marketing consortium and undercut prices on the world market. Some financial analysts are postulating that could have a ruinous impact on Saskatchewan’s economy. But Wall said Wednesday it’s too soon to tell what impact the situation will have on the province. “I think it’s important we not overreact to the news, as significant or important as it is,” Wall said. He admitted that if potash prices drop the government’s spending will be tighter. The budget for this fiscal year is expecting more than $500 million in potash royalty revenues but Wall reminds people that only amounts to five per cent of provincial revenues. POT gapped down two days ago, on the breakup of the global Potash Cartel. It could rise from here, back into the Gap. POT announced a $2 Billion Buyback program, so that may fuel some buying. You can buy an Aug.$28 call for about $1.40 now (LOD was $1.12). and the option would be worth $8 - that's more than a 5-bagger. And if the stock trades sideways, you lose just a bit. PotashCorp New Brunswick employs 525 staff in addition to hundreds of contractors in Sussex, and is the biggest mineral royalty engine for the province, generating $25 million last year. Potash, a key ingredient in fertilizer, is also the largest dry bulk commodity moving through the Saint John port. PotashCorp is also preparing to bring its new $1.67-billion mine near Sussex online, which will more than double production from the existing mine once it is fully operational by 2015. Brown said price volatility cannot reverse that commitment. "I think the big impact would be on those who are considering entry into the market with new mines," he said. "Whether or not somebody is prepared to invest billions and billions into a new mine." Keith Attoe, a director with Atlantic Potash, came on the scene two years ago. In February, he announced plans to build a $350-million fertilizer plant in Saint John. Attoe had visited the province before to sign a lease in the Sussex area. He said his company, backed by Chinese investors, was optimistic about starting its own mine in Millstream. In a statement to CBC News on Tuesday, Attoe said, "We are monitoring the situation, and at this time there are no changes to our plans." ... a Reuters report concerning the potential for Eurokali and Belaruskali getting together again to market their potash production. This along with the recent rise in corn, soybean and palm oil prices, at the very least, gives much optimism regarding fertilizer prices in general and potash specifically. The logo of Russian potash producer Uralkali is pictured at the company's stand during the St. Petersburg International Economic Forum 2016 (SPIEF 2016) in St. Petersburg, Russia, June 16, 2016. The Belarussian businessman who last week acquired a 20 percent stake in Russian potash producer Uralkali said on Monday it would be in everyone's interest to restore an alliance between Uralkali and Belarus, the world's two biggest potash miners. Uralkali and the Belarussian Potash Company (BPC) used to cooperate with each other, helping to manage supplies and underpin prices. This arrangement broke down in 2013, triggering a fall in world potash prices. Russian businessman Mikhail Prokhorov's Onexim Group sold its 20 percent stake in Uralkali to Belarusian businessman Dmitri Lobyak last week. Speaking by phone to Reuters, Lobyak said "Everyone has a desire (to restore the alliance between Uralkali and BPC). This would be in everyone's interest." The share deal does not automatically mean the alliance is back on, because Lobyak does not control BPC, which is state-owned, and he has only a minority stake in Uralkali. In June, Belarus agreed to sell potash to India at the lowest price in a decade and about a third less than last year's level as global supplies of the crop nutrient exceed demand. At the time, Uralkali said that the price offered by Minsk was too low, while the managing director of Indian Potash Limited, the country's biggest importer, said he expected other potash miners to offer decade-low price after that deal. Belarus President Alexander Lukashenko said last month that his country might cooperate with Uralkali again. Sirius Minerals, a publically listed company on the London Stock Exchange’s AIM market, aims to be a world leading producer of multi-nutrient fertilizers. Our area of interest contains the largest, highest grade resource of polyhalite to be found anywhere in the world. Results confirmed that our area of interest contains a polyhalite resource of 2.66 billion metric tonnes, as defined according to the internationally recognised JORC code. This is just 7% of the Project area of interest and provides an asset excess of 100 years. Within the resource area, there is a JORC compliant Probable Mineral Reserve of 280 million tonnes of polyhalite. "Sirius Minerals is “closer than ever” to fulfilling its aspirations of building a world class mine in North Yorkshire, after it secured the final major approval for the project and its infrastructure. The AIM market favourite confirmed today that the UK government had given approval for harbour facilities on Teesside necessary for exporting the mine’s valuable polyhalite products (which will eventually be used is speciality fertilisers). I will pick some up at the right point,just feel they've raced ahead a bit. I've now bought some Potash Saskat. I'm not a massive fan of stocks at the minute but I've bought in with a view to buying more if broader markets roll over. 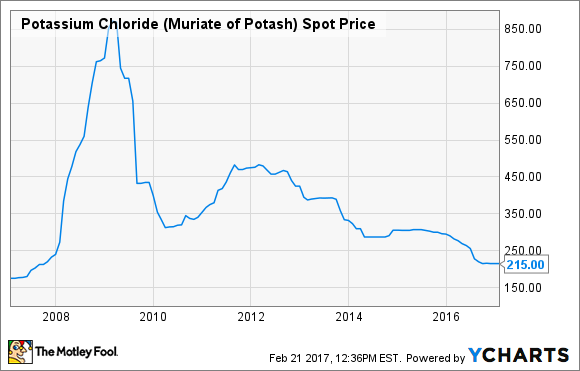 Potash: How Undervalued Can One Commodity Get? 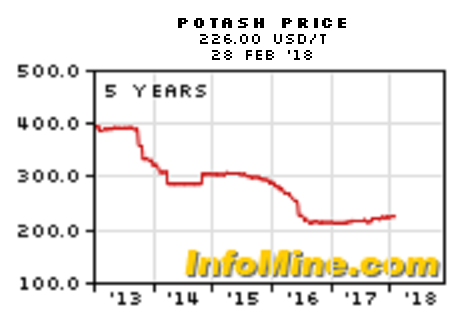 Potash last year hit a nine-year low in terms of U.S. dollars. But it hit a thirty-year low in terms of gold.